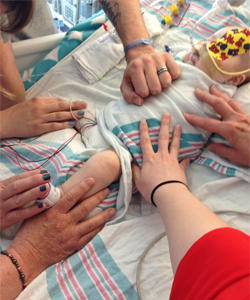 We were able to hold Harper right before her open heart surgery. 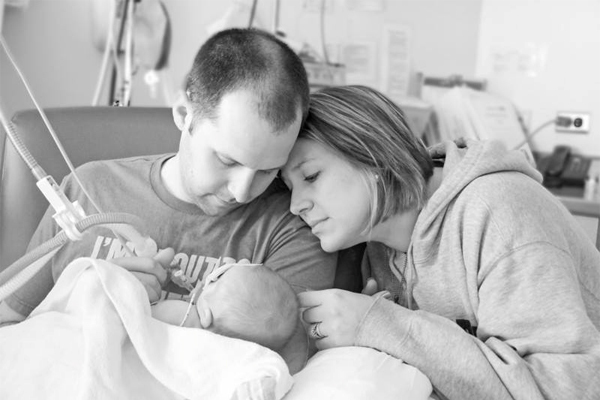 Thinking back over the last 39 days in the PICU, the days run together, especially before Harper’s heart surgery. When we brought her in she was very septic. They intubated her as soon as she came up to the PICU from ER. She had lines coming from almost every extremity. They had her so sedated that she slept constantly. I knew this was all for her own good, but when I thought that just a few hours before she had been in my arms, my heart literally hurt. Those first few days, and even first few weeks, were a blur. Harper was getting fevers all the time but they could never figure out why. Every test came back negative. I remember at rounds every morning, the PICU team would do their best to try to figure out the course of action that would help Harper. Standing there, listening to everyone doing their part is a very cool thing to be a part of. All of the doctors, nurse practitioners, surgeons, cardiologists, pharmacists, respiratory therapists, residents – everyone was there to help my daughter get better. Harper has many praying for her, from here in Akron to Thailand, India and Africa. When we were first admitted, the consensus was to get her better, send her home to get stronger and come back for her heart surgery when she was bigger and healthier. As time went on, I began to question if we were really going to be able to go home before her surgery. 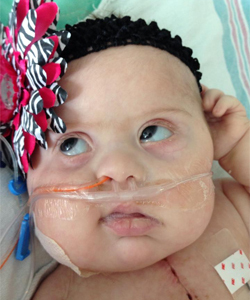 In the weeks leading up to her open heart surgery, Harper developed pulmonary hypertension. On top of her heart failure, this was not a good development. One of the doctors sat me down and told me that she didn’t think Harper was going home before her heart surgery. I appreciated her honesty, but at the same time, was heartbroken. I just wanted her to get better and go home. It got to the point where we had to have our sit-down meeting with the surgeons, Drs. Smith and Spector. They wanted her to go to the cath lab. While she was there they would measure the pressure in her lungs. Then they would introduce things that she would be on after surgery- oxygen, certain medications, nitric oxide. The hope was that when they introduced these things the pressures would go down, indicating that they would help her hypertension. If the pressures didn’t go down, the surgeons said there would be no reason to have the heart surgery because it wouldn’t help. Those are words that no parent ever wants to hear. I don’t know if I had ever prayed as hard as I did in those next few days. She went to the cath lab and passed. Her surgery was scheduled for 2 days later on Thursday, June 5, at 8 a.m. The morning of surgery, we were a ball of emotions – happy that her heart was getting fixed, nervous because we didn’t want anything to go wrong, and anxious to see her again. Those might have been the longest 6 hours of my life. We were surrounded by family in the waiting room which helped. I knew it was all necessary, but it was a lot to take in. Little did I know that the days after her surgery would be more stressful than all of the days leading up to the surgery. Waiting to see if her “new” heart would learn how to function correctly was excruciating. Little by little, day by day, she was getting better. They were able to wean medications down and eventually off. 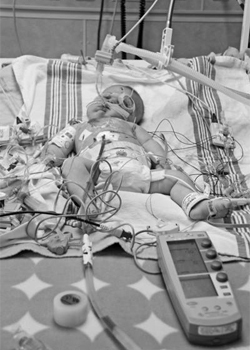 One of the last big hurdles was her breathing tube. She had been on it for a very long time, I wasn’t sure if she even remembered how to breathe. They began by giving her breathing exercises, or breathing trials, a few times a day. This was to make her exercise her lungs and make them stronger. The breathing tube was taken out after almost 6 weeks. On Tuesday, June 17, the tube came out. She is doing well and on a nasal cannula for the time being while we make sure her lungs continue to function correctly with her new heart. I am so proud of my daughter. She has taught me more than I ever expected. The PICU staff has been beyond wonderful. While each doctor has their own approach to doing things, they all work towards the same thing – getting Harper better and sending her home. I don’t know if there will ever be a way that we can thank them for what they have done for us. Some of the nurses have become like family and as happy as we will be to take her home, we will be equally sad to leave them. Hopefully our next post will be from home! Tonya Cunningham lives in Green, Ohio, with her husband, Aaron, and children, Kaitlyn, Landon and Harper. She is a first-grade teacher at Walker Elementary School in Canton. Tonya shares her experiences of overcoming the odds in her “Ups and Downs with Harper” blog, after receiving the surprise of a Down syndrome and heart defect diagnoses at birth.